Earlier this month I was invited to read Beth Kobliner's book Make Your Kid a Money Genius (Even If You’re Not) in order to share my experience with my readers. It turns out that the book was really great and it inspired me to get my kids involved in this year’s $25/week budgeting challenge. Beth’s book reiterated my belief that setting and sticking to a strict budget should involve the entire family! Her book was jammed packed with insightful and easy to understand budget advice, and demonstrated how you to teach budgeting skills to kids of ANY age. They are never too young nor too old. It was just the boost I needed to bring my kids into my budget challenge! One of my favorite take away messages was that we should be using our real life experiences to teach kids about making smart budget choices, and for me, one of those places is the GROCERY STORE! No matter how old your kids (Mine run in age from 3-11) you can create learning moments at the grocery store. Just like Beth’s book, I have broken down my suggested lessons by age range. Keep in mind these age guidelines are only suggestions. You know your child best and can best decide what you child is capable of understanding. “This box has 6 granola bars. Let’s count them!" Create a visual (drawing based) shopping list for your child to shop with. “Which is a healthier snack? Cookies or Apples?” “Let’s pick something green to eat with our dinner!" “This cereal cost $4 and our budget is $10, how much money will we have leftover?" Introduction to currencyIdentifying bills/coins and their value. “We can buy one dessert item. What should would you choose?" “Let’s keep a running tally of the cost of items in our cart?" 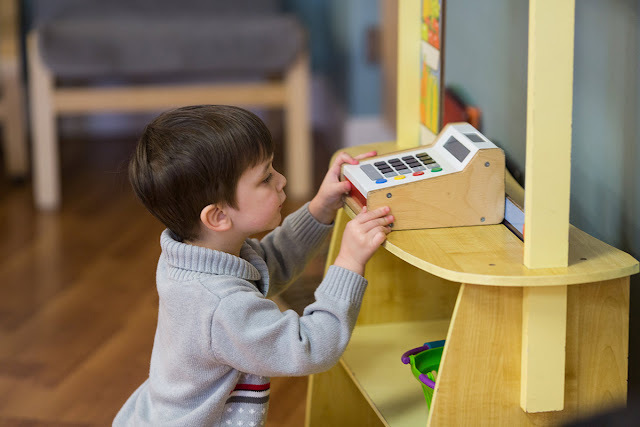 Allow your child to pay with cash and make sure they get the correct change. Understanding value:"Which is a better deal? $0.89 for one or 5 for $4?" Buy a name brand item and its generic equivalent. Have a taste test to compare them. “Our dinner should have a protein, starch and vegetable, how can we accomplish this balance?" "How many servings is this bag of cookies? Is that reasonable?" “What are some most affordable protein sources? “If you earn $12 an hour, how long would you have to work to buy this?" “Which is a less expensive per cup? Coffee in these coffee pods or this bag of ground coffee? “If you earn $12/hour and income tax is 22%, how long would you have to work to pay for $100 of groceries." “This 100% maple syrup is $12.99. This pancake syrup is $2.99 and contains corn syrup. Is there a difference?" 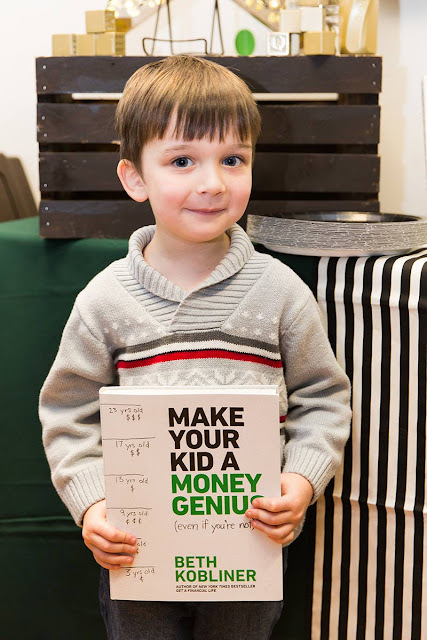 Make Your Kid A Money Genius (Even If You’re Not) is written by bestselling author Beth Kobliner and is based not he latest research from the fields of psychology, child development and behavioral economics. It is now available on Amazon. This post was written by me on behalf of The Beth Kobliner LLC. The opinions are my own.